A new website has been launched designed to stop us demanding needless antibiotics which won’t cure our colds and flu anyway. Treat Yourself Better is a new campaign from Pharmacy Voice and the PAGB, the UK trade association for manufacturers of over-the-counter medicines. It aims to educate people on normal symptom duration and provide advice on self-treatment with pharmacy support. The goal is to reduce unnecessary visits to GP surgeries - estimated to cost the NHS £35.2 million a year. Antibiotics are not an effective treatment for colds and flu and many people also don’t understand how long their symptoms should last. 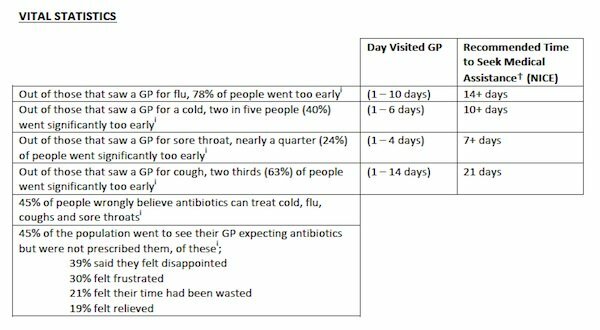 Two in five people (40%) see a GP for cold symptoms ‘significantly too early’ compared to NICE guidelines on when GPs should consider prescribing antibiotics. The new website features a symptom checker and warning signs support material, to help people understand how long symptoms could last for and when it is appropriate to seek medical assistance. The statistics below are based on the website's survey of 2000 adults in October 2013 and the NICE guidance on prescribing antibiotics.